The Tian Tan ‘Big Buddha’ is one of Hong Kong’s top attractions, and the best way to get there is via the Ngong Ping 360 cable car, on a scenic 25-minute ride across the sea, and high above the lush mountains of Lantau Island. Your trip begins in Tung Chung, the town right across from Hong Kong International Airport. You can get to Tung Chung by MTR or bus, and then follow the signs to the Tung Chung Cable Car Terminal. There are three cabins to choose from—the Standard Cabin, the Crystal Cabin which has a glass floor, and a Private Cabin, a sort of VIP service which lets you skip the line and go straight into your own cabin which you won’t have to share with other passengers. 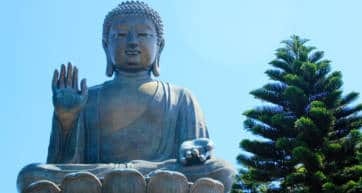 Regardless of which you choose, it’s an incredible 25-minute trip across the green waters of Tung Chung Bay, with great views of the airport, wetlands, waterfalls, the virgin forests of the Lantau North Country Park, and finally at the top, the Big Buddha. The cable car arrives up at the Ngong Ping Station, and as you exit you walk through Ngong Ping Village, designed with traditional Chinese architecture, and a number of restaurants, cafes and souvenir shops. Follow the path through the Ngong Ping Piazza, which is lined with Buddhist statues, and a beautiful white ornamental gate. The Piazza leads you to the star of the show—the Big Buddha—as well as the impressive Po Lin Monastery. In addition to the cable car ride, Ngong Ping 360 sells a number of combination passes. A really useful one is the 360 Tai O Pass, which includes the round-trip cable car ride, a bus ride to and from Tai O, a boat excursion to see pink dolphins in Tai O, and a snack voucher. There are a number of entertainment packages which include the cable car ride, plus the experiences at Ngong Ping Village. The options are the VR 360 virtual reality experience; Stage 360 which demonstrates stunt work in the Hong Kong film industry; and Motion 360, an immersive 4-D film experience. There’s also ‘Walking with Buddha’, which includes a short video about the history of Buddha, a small temple, and finally the Path of Enlightenment. Most people, however, take the cable car up, skip the tourist traps in the village, and go straight to the star of the show—the Big Buddha—and the beautiful Po Lin Monastery. The cable car gets very, very busy on weekends, so book online in advance to avoid the queues, and try to get there before opening time, which is 10am on weekdays, and 9am on weekends. 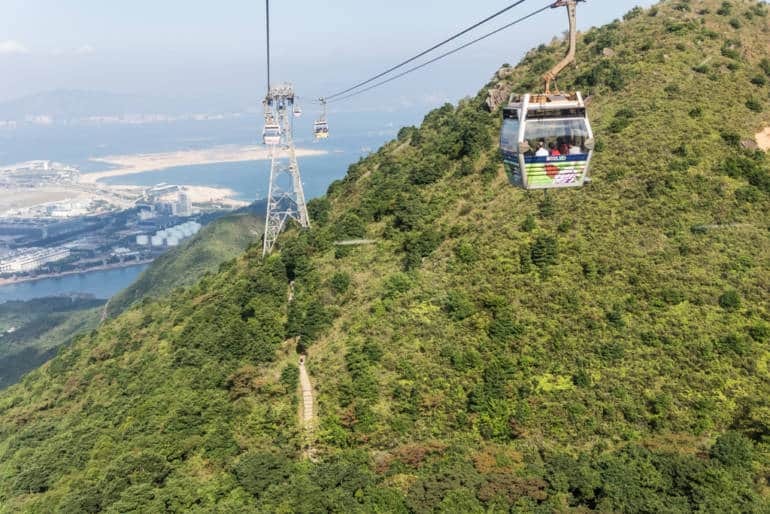 Alternatively, you could go closer to closing time when the crowds are less dense, ride the cable car up, and then take New Lantau Bus #23 back down to Tung Chung if the cable car is closed by the time you want to leave. Parking available at nearby Citygate Outlet mall by the hour, and at the Big Buddha, but a Lantau permit is required. Only blue taxis can go to Big Buddha.